Not long ago, I started a new job. Well, in truth, it’s not new, really. I just transferred to a new location. Same job, different building. Same job, different colleagues. Same job, different challenges. So, the same but different. Anyone else out there dealing with different right now? 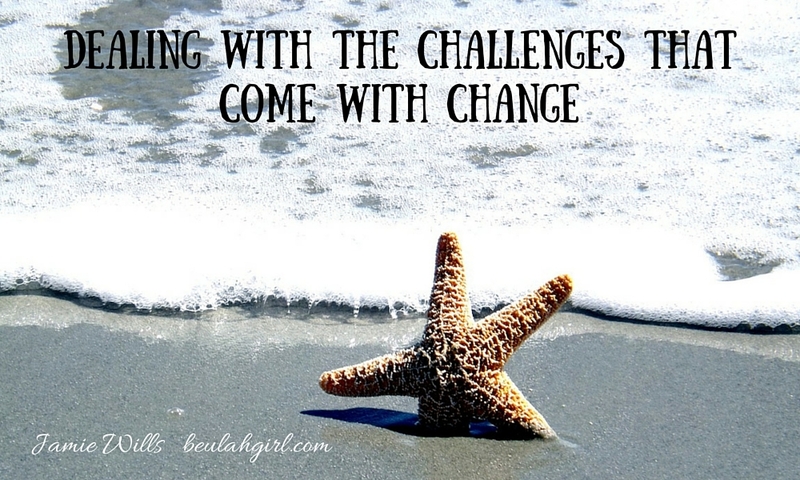 Change can bring tremendous blessing, but it can also bring tremendous anxiety. I can testify to this, and I suspect others can give the same declaration with similar confidence. Change is a part of life, but it does, more often than not, come with a roller coaster of emotions. Different can be scary. And when different begins to present challenges, you start to second guess your decision to embrace change in the first place. Even though it may have clearly been the right decision to embrace this difference, these doubts can be painful. And so much comfort in life comes from the predictability of routine, the familiar people that surround us, and our everyday environment, so when one of those things (or all of them) changes, we can suddenly feel disabled. It’s as if we’re toddlers struggling to learn how to walk again. Tripping over our own feet. Stumbling over unfamiliar territory. Wondering if there is something, anything, nearby we can hold on to that would help guide our way. Moving away from home? Changing jobs? Making a life-changing decision like staying home with the kids? Or homeschooling? Searching for a new church home? 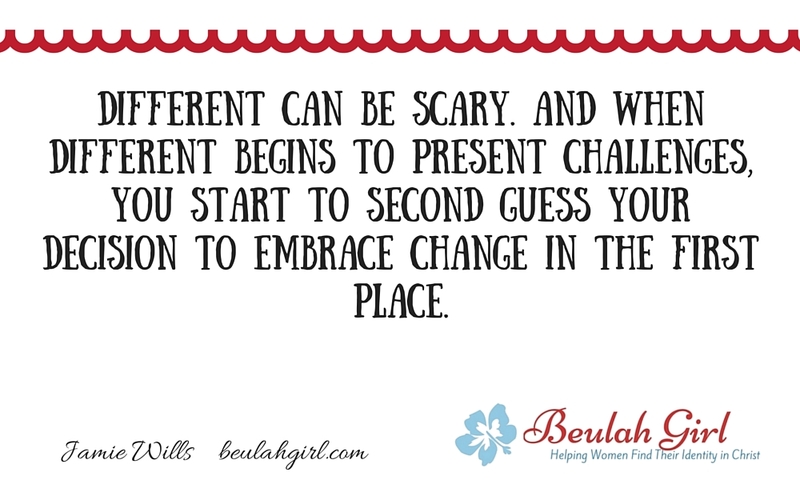 What is your change — your different — that is seemingly pressing in on you? During this challenging time in my life right now, this time of transition, my biggest struggle is with finding a new rhythm. I’m trying to relax and enjoy my new surroundings, but everything feels so awkward, so foreign. It’s distressing and wearisome. When we feel that God has asked us to make a change, and we are obedient to that prompting, it can be hard, trying. We may feel as if we are being pounded and crushed. However, after time passes, we are sure to reap a harvest of joy from our submission — whether it’s in this life or the next. Meditating on this truth found throughout the Bible helps me when situations threaten to overcome me. The knowledge that these present trials can be used for future good helps me get out of bed every morning. Just taking time to remember that everything turns out all right in the end brings me great comfort. He is in control. He is on His throne. He works all things for the good of those that love Him. During your quiet time today, thank God for what He is doing in your life. Take time to let His peace, that surpasses all understanding, wash over you. I have come to a place where I can thank God for my new job — and all its new challenges. After being reminded by God’s Word that the hottest fires bring forth desirable things in my life, I can approach Him now with thanksgiving in my heart. Because now I realize that difficult is only temporary, and God has so much He can do through it. Will you join me in praising Him for your new change? Trust me. It helps.